When I was growing up, there were two kinds of Sundays: regular Sundays and George Sundays. George was the proprietor of a local Italian restaurant in my hometown and hosted the extended LaRusso clan for Sunday lunch every few weeks. His restaurant, appropriately named George’s, owns some of my favorite childhood memories – and some of my worst. Every couple of months, my aunts, uncles, a baker’s dozen of cousins, and my immediate family members would take over George’s backroom and see if we could challenge the city’s noise ordinance. George would do nothing to discourage us, appearing every so often to fire balls of uncooked dough at us or ply us with more caffeine-laced sugary drinks, despite instructions to the contrary from our parents. Invariably, though, an otherwise pleasant afternoon took a turn for the worse as we were leaving the restaurant. That was when my parents, thinking they were doing us a favor, would let us choose one item off George’s famous “candy wall.” You see, George didn’t stock just one or two different kinds of candy, he had dozens. Every different kind of chocolate bar, brand of gum, and flavor of jelly beans beckoned from George’s Candy Wall. For a 6 or 7-year-old kid, it was just too much. All these choices literally paralyzed me. Ten minutes of indecisiveness and several ultimatums later my parents would usher me out of the restaurant, usually empty-handed and crying. Even on the rare occasions when I did settle on something, I spent the rest of the afternoon lamenting my decision, thinking I left behind something that I would have enjoyed more. When it comes to the multitude of great support and learning resources we offer new users of SAS, I often wonder if it can feel like you’re staring at George’s Candy Wall as well. While support.sas.com remains the holy grail of SAS customer support, there are so many good choices, it can sometimes be hard to know where to start. 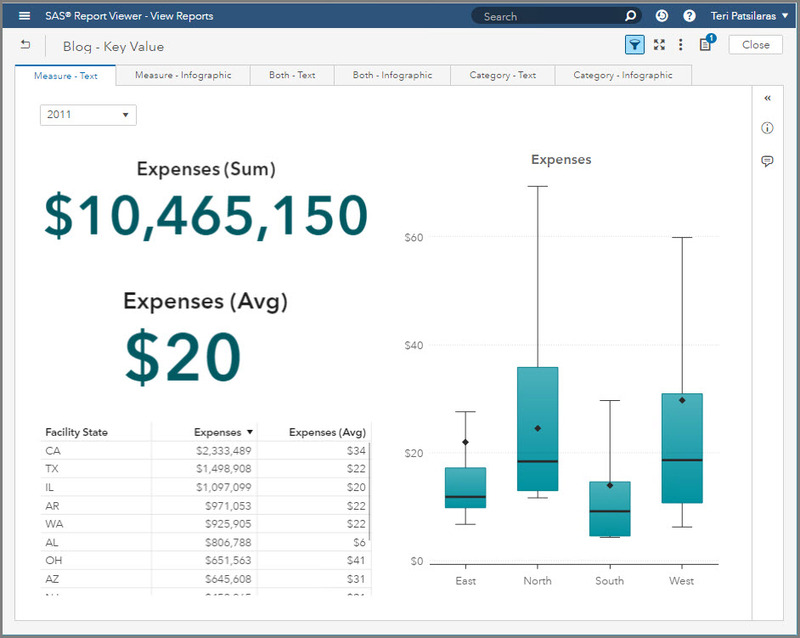 That’s why we’ve put together a new resource to make things easier for new SAS users: the SAS Starter Kit. 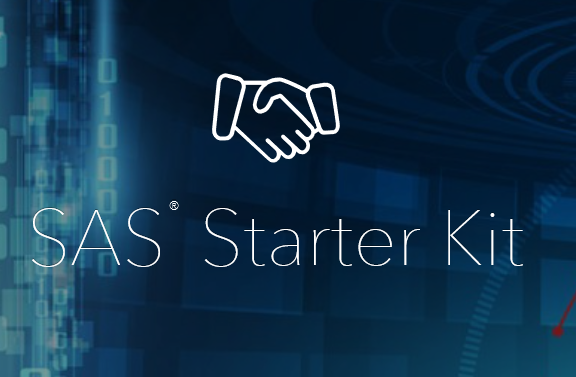 The SAS Starter Kit is the perfect place for SAS newbies to start, outlining the five essential steps to help you learn the basics, grow your skills and connect with other users from around the world. Step 2 is your SAS Resource Cheat Sheet. SAS Cares is your one stop listing of all the SAS resources you’ll ever need. Add it to your web favorites or print it out and add a little color to your cube. Keep this one close; it provides quick, one-click access to some of SAS’ most helpful resources. Step 3 is designed to expand your SAS knowledge. This step introduces you to a full menu of free tutorials to binge watch, a number of free e-courses for a deeper dive and a number of other learning resources from e-books to webinars and more. Step 4 is the perfect resource if you’re completely new to SAS or just trying something new. Our New SAS User Community is a great place to get coding help, share ideas and best practices, or just lurk! Our SAS Communities have more than 200,000 members ready to help get you unstuck or share what they know. Finally, Step 5 introduces you to product-specific resources to help develop your skills with your specific tools. Here you’ll find the latest product news, code samples, and step-by-step instructional resources to guide you through common tasks using your product of choice. I hope you find the SAS Starter Kit a sweet addition to your SAS toolkit. Navigating the Candy Wall of SAS Support Resources was published on SAS Users. I’ve mocked up several reports to show some of the combinations available to give you an idea of what the Key Value object can look like. Toward the end of the blog, I will add additional reports to provide design ideas for placement and action assignments. Click on any image to enlarge. Here you can see in the report, I am highlighting two measure values. 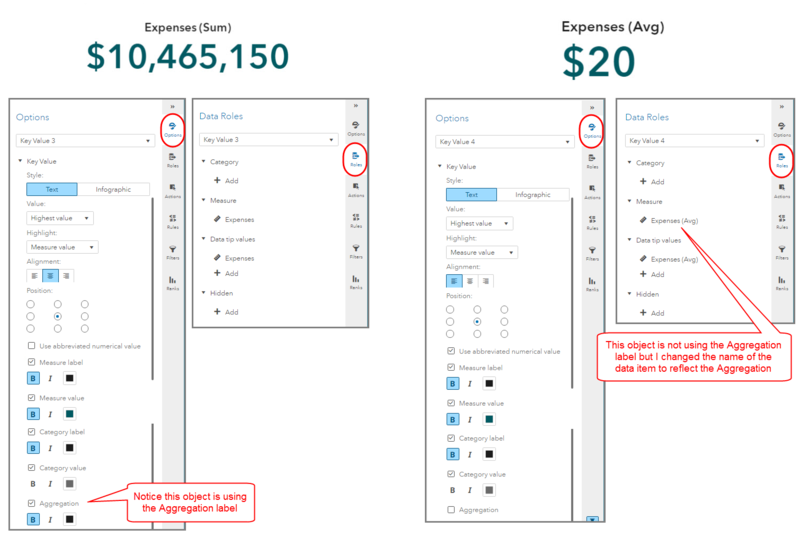 Both are representing the Highest value but I selected one to show the aggregation and the other not. I was able to mimic similar headings by renaming my data item. Be sure to look at the Options and Roles pane for the assignments to understand how I accomplished this. Here is the same information represented using the Infographic style. 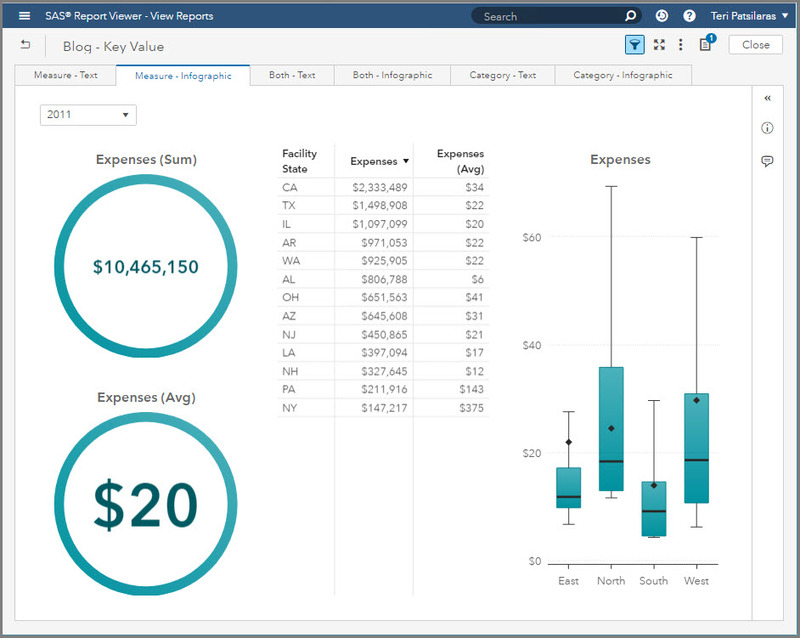 Seeing the same report using the different styles allows you to quickly determine the most powerful and appropriate visualization to meet your needs. We cannot control the size of the circle, only the color. In this case, the circles are different thicknesses because of the number of characters used to represent the measure values inside the visual. 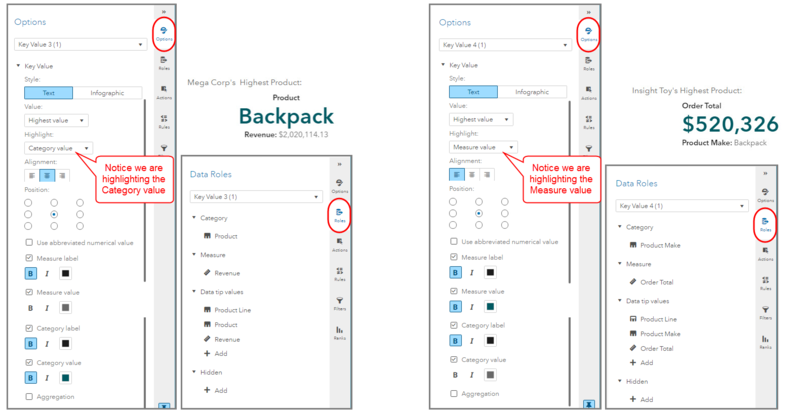 In this report, I have shown how to use the Text style to display both a Category value and a Measure value. As you can see, only one can be Highlighted, i.e. given the largest font. Notice that in this report I used the object’s Title to help explain the key value being displayed, this is a recommended best practice. Below I am using the Infographic style and notice in the Options pane below that I had to use the Additional information attribute to better label the data. Make sure that when you are in the design phase and toggling between text and infographic to review and test the available Key Value Style attributes to better label the visual. In this report, I show how to highlight the Category value using the Text style. Since I chose to not use any of the available label attributes it is critical that I use the object’s Title to better explain the key value displayed. 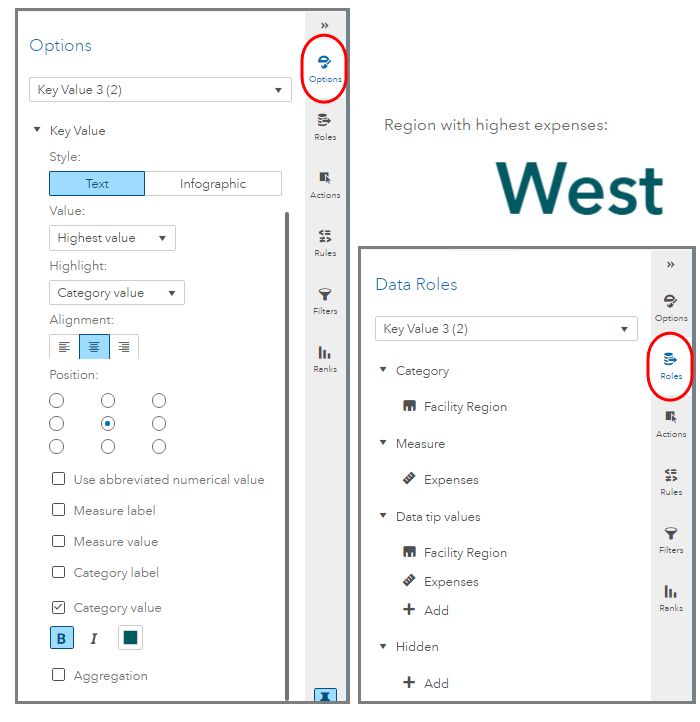 In this report, you can see how I changed the layout from the previous report to make the Key Value object side-by-side the other report objects. 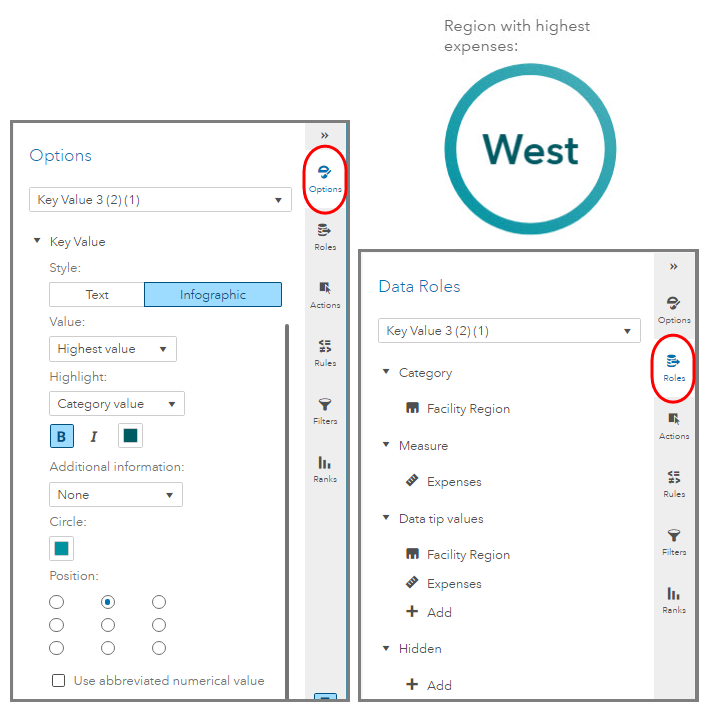 If you are interested in using the Infographic style with the circle enabled then you may have to adjust your report design to accommodate for the space the circle needs to display. Remember not to shy away from adding white space to your report, it can assist when adding emphasis to a particular visual, in this case a key value. 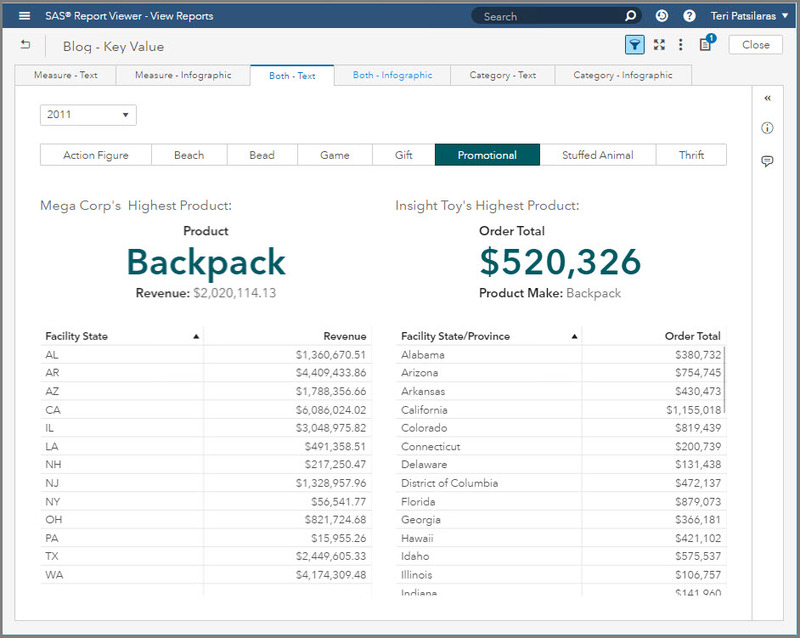 Use the Key Value object’s Title to inform your users what the number or category value represents so there is no ambiguity as to if they are looking at the maximum or minimum value. When determining which style you prefer, Text or Infographic, it may be easier to make a duplicate of the Page and then adjust the style attributes till you find the desired combination. 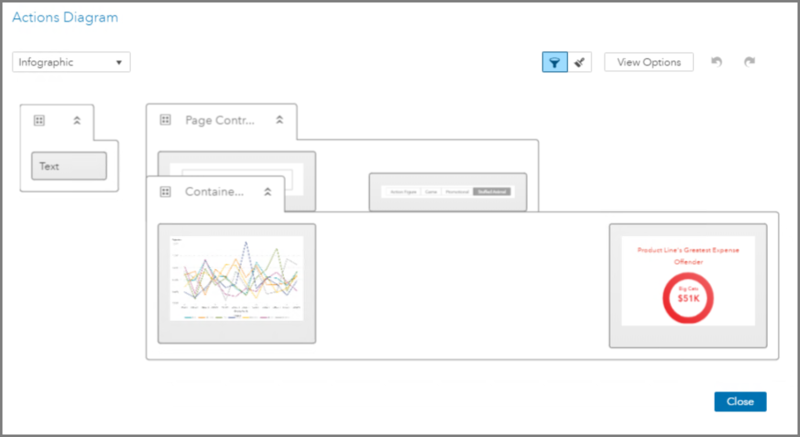 Take time to adjust the arrangement of objects on your report to get the most pleasing configuration. Don’t shy away from leaving white space in your report. You can also experiment with the Container object using the Precision container type to layer the Key Value object. 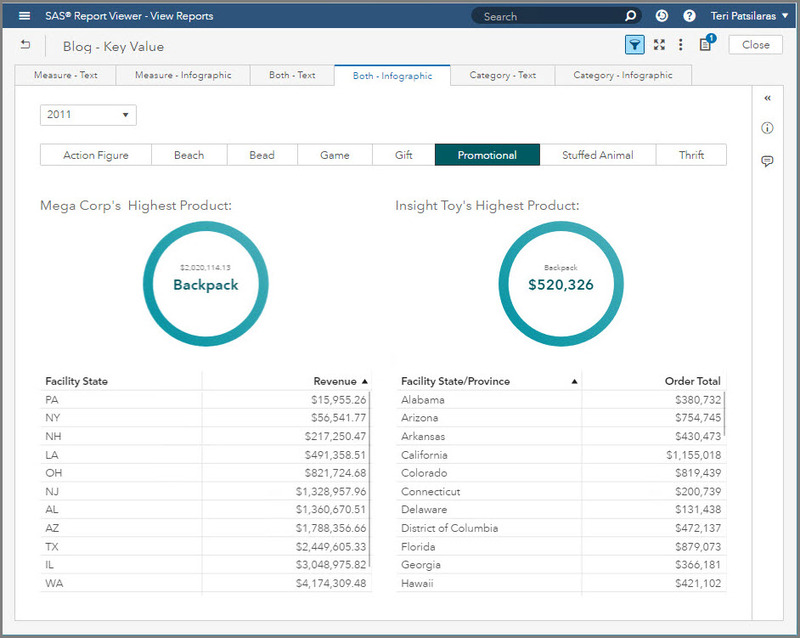 The Key Value object will be affected by Report and Page Prompts like any other report object and you can even define Actions to filter the Key Value object. In this example, we can see from the Actions Diagram that I used the Container object. I then selected the Precision container type and overlaid the Key Value object on the Line Chart. The only filters applied to these report objects are the page prompts. And in this last example, you can see how I have no Report or Page prompts or any other filters impacting the Key Value objects. Therefore, these values are representative for the entire data. 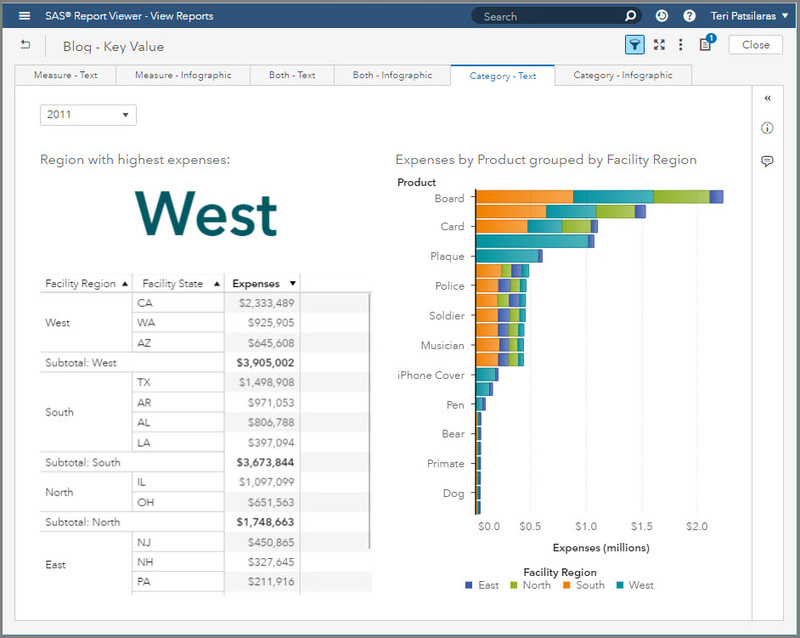 Key Value Object in SAS Visual Analytics was published on SAS Users. 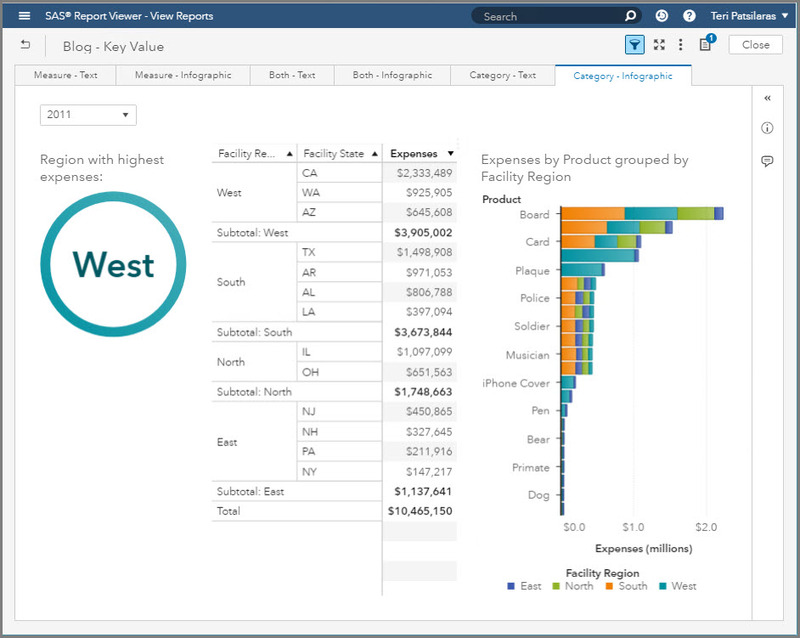 SAS author Jane Eslinger shows give you tips for working with PROC TEMPLATE when diving into the Output Delivery System (ODS) world. Learn how to create a custom style template to get the stylized output you want. 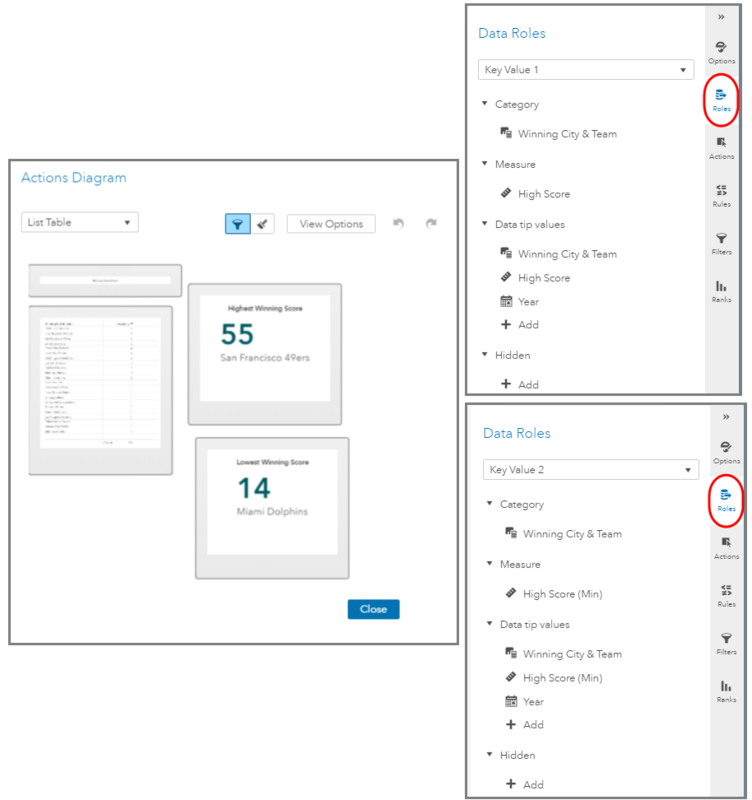 The post Custom Style Templates: Start Small appeared first on SAS Learning Post. For those of you who weren't able to attend SAS Global Forum 2018, you can still learn a lot from the content shared there. Gain knowledge from your SAS family. SAS Global Forum 2018 papers and videos now available. The post Knowledge from the SAS family: SAS Global Forum 2018 papers and videos now available appeared first on SAS Learning Post. SAS Global Forum 2018 is just days away, and if you're one of the 6,000 SAS users heading to Denver for the event, get ready for four days of learning from SAS peers, exchanging ideas, discovering new techniques for using SAS, and a bit of fun as well. But what if you can't make the trip to Denver this year? Is there another way to experience some of the great content that will be shared there? I'm happy to say the answer is yes! Once again, SAS will provide dozens of hours of live video streaming from the event. Register for an All-Access Pass and watch select sessions including Opening Session, keynote talks, select breakouts, Tech Talks, updates from The Quad, interviews with SAS executives and developers, and more. You can find livestream presentations and add them to your calendar here. Coverage will be available for on-demand viewing on SAS Global Forum Video Portal after the conference as well. Video not your thing? No worries. 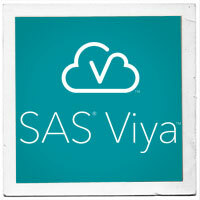 SAS will provide several other ways to stay up to date. For starters, you can read any of a number of blog posts from the event. Posts will come from many different SAS blogs, but all posts from SAS Global Forum will be aggregated here. If you're on LinkedIn, Twitter or Facebook, you can stay connected with what's happening and engage with attendees on SAS’ social media channels. 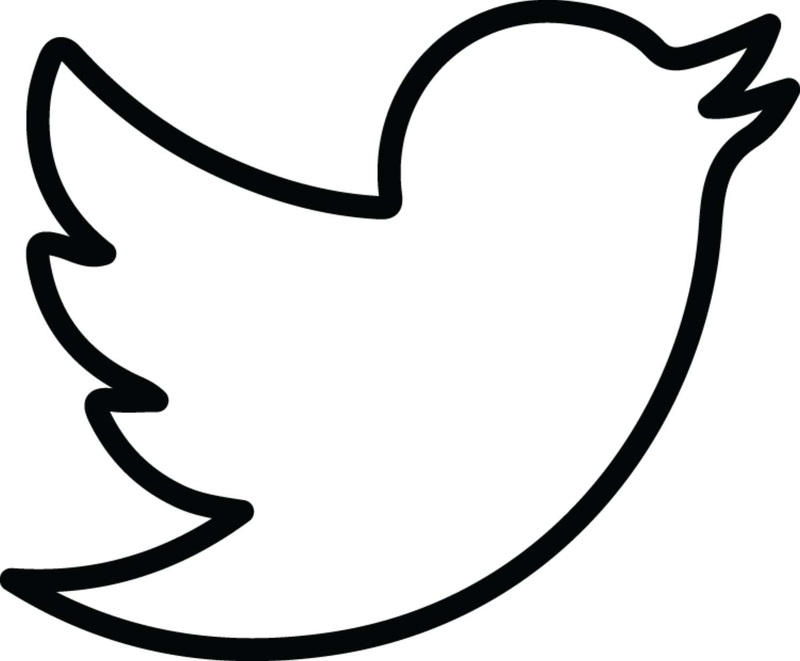 Join the conversation, comment on some of the cool presentations you attended or viewed, discuss the exciting news coming out of the event, or simply follow along. The channels sure to have the most activity are the SAS Users LinkedIn group, the SAS Twitter account, the SAS Users Group Facebook page; and Instagram. The hashtag for SAS Global Forum is #SASGF; be sure to use the hashtag in all your posts. 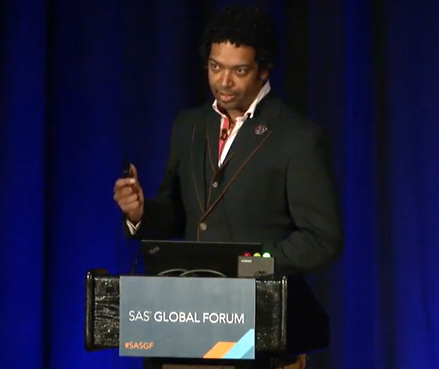 If you want a deeper dive into a particular talk, or if you're interested in presentations that may not be part of the Live Stream, the proceedings for SAS Global Forum 2018 are already available. Here you'll find abstracts, PDF of papers, e-posters, slides, data files, and more. With all the opportunities to follow along, connect and contribute, you can be a part of SAS Global Forum 2018, whether you're attending in person or not. Enjoy the event...whether you're going or not! Participate in SAS Global Forum 2018...even if you're not going was published on SAS Users. SAS Global Forum 2018 takes place April 8-11 in Denver. The following post is from Sebastian Dziadkowiec and Piotr Czetwertynski, presenters at the event. You can join Sebastian and Piotr for their talk: “An Agile Approach to Building an Omni-Channel Customer Experience” on April 9 at 2 p.m. in Meeting Room 302. We'll also post their presentation here after the event has concluded. Most organizations acknowledge that building a seamless and consistent customer experience is critical to long-term success. The big question is: Now what? With all of the channels to stitch together – from brick and mortar experiences to online clicks – how do you track and make sense of all that customer data? And, more importantly, how do you use that data to create the very best customer experience? 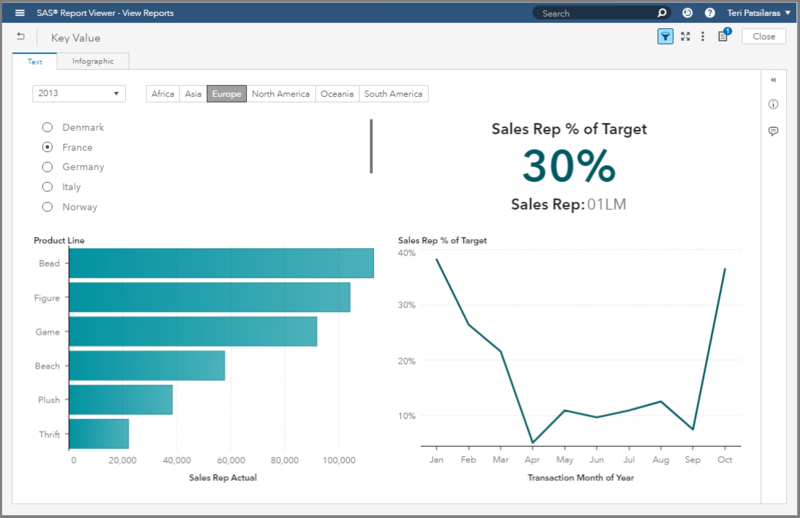 Over many years of implementing SAS Customer Intelligence and helping our clients give their customers exactly what they want and when they want it, our team has identified some characteristics that make for successful projects. Here are some of the key components that most often make or break a Customer Intelligence project. Everyone likes to see value generated quickly and reaching the break-even point for project within weeks of project launch is critical. In case of campaign management, it is possible. Instead of following the traditional waterfall path, with all the IT-heavy components like requirements gathering and analysis, solution design, many streams of implementation and testing, it is worth considering releasing a minimum viable product as soon as possible. Such approach allows us to focus on delivering business value and field-testing all the creative ideas, rather than building an IT system in perfect accordance to requirements, and one that may no longer be relevant at the day of release. Go beyond traditional, rule-based approach to get the most out of the data you have. Nowadays, everyone speaks about machine learning, big data, NBA, artificial intelligence and so on. It is up to each organization and CI project to forge those fancy buzz words into real value, by embedding advanced analytics techniques in the decisioning process. There are many ways to boost various use cases by the advanced methods; make sure you will be able to use all you need and integrate their results seamlessly, regardless of when and how you engage with your customers. While working on a CI project you should also keep in mind other areas: project organization, building a future-proof solution that will stay relevant for years, and constant search for additional opportunities to use available data and solutions to generate incremental value beyond the core scope of customer intelligence project. There isn’t a one-size fits all approach to implementing a CI project, but these lessons learned can greatly increase your chances for project success – successful delivery generating a high ROI in a short timeframe while staying relevant in the long run - through the very best possible customer experience. Join Sebastian and Piotr for their “An Agile Approach to Building an Omni-Channel Customer Experience” Breakout Session at SAS Global Forum April 9 at 2 p.m. in Meeting Room 302. Piotr is Customer Analytics Manager in Accenture. He has 11 years of experience in Campaign Management and Analytics. 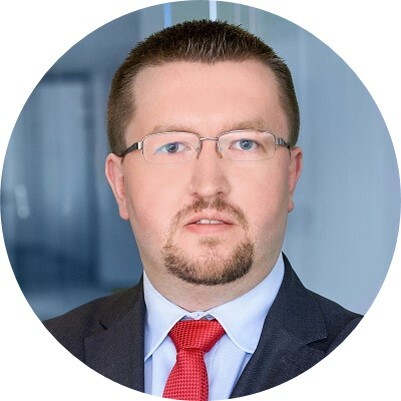 Currently he is one of the people responsible for launching of Accenture Center of Excellence for SAS CI in Warsaw, Poland. Piotr recently focuses on solutioning & strategy in the areas of campaign management, BI & Analytics. Sebastian has 8 years of experience in technology and management consulting, mostly in communications industry. He went through the entire project lifecycle on numerous engagements, starting from programmer, through business and technical analyst, up to solution architect and team manager on large-scale analytics projects. Sebastian specializes in analytics solutions technology architecture, particularly focusing on customer intelligence and big data. 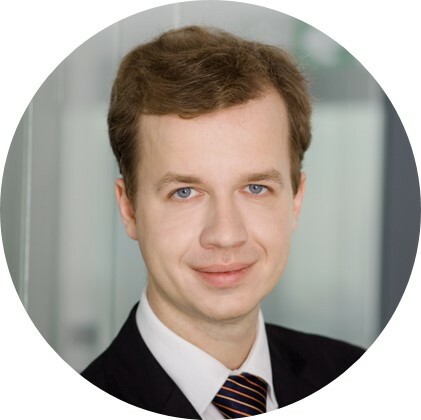 He serves as technology lead in Accenture Center of Excellence for SAS CI in Warsaw, Poland. Keys to building a successful and future-proof omni-channel customer experience was published on SAS Users. According to Glassdoor, data scientist tops the list of the 50 Best Jobs in America. The rankings are determined by combining three factors: number of job openings, salary and overall job satisfaction rating. With a median base salary of $110,000, an abundance of unfilled positions and high job satisfaction, there’s no denying that data science is hot. The post The Best Job in America appeared first on SAS Learning Post. Goutam Chakraborty is a busy man. In addition to serving as SAS professor of marketing analytics at Oklahoma State University, Dr. Chakraborty is the director and founder of the SAS and Oklahoma State University MS in Business Analytics and an award winning author and professor. He teaches courses in such areas as business analytics, marketing analytics, data mining, marketing research, and web strategy, and has been preparing students to enter the workforce with advanced skills in marketing and analytics for more than 20 years. Throw in the regular consulting engagements he has with some of the world's top companies and it makes you wonder if Dr. Chakraborty has time to add anything else to his already full plate. Well, this year at least, you add SAS Global Forum 2018 Chair to the list - likely at the expense of a good night's sleep. As the largest gathering of SAS users in the world, SAS Global Forum will attract more than 5,000 SAS professionals for several days of learning and networking. Recently, I sat down with Dr. Chakraborty to talk with him a bit about this year's conference, which takes place April 8-11, 2018 in Denver. I left excited about SAS Global Forum 2018 and, at the expense of losing credibility as a fair and balanced reporter, convinced that Dr. Chakraborty is one of the nicest individuals you'll ever meet. Larry LaRusso: I know you've been preparing to chair SAS Global Forum 2018 for more than three years, but now that the event is only a few weeks away, how excited are you to kick this thing off? Goutam Chakraborty: More excited than you know Larry. I've participated in many SAS Global Forums, but serving as chair gives you the ability to influence every aspect of the event, from speaker and content selection to charity-related events and networking opportunities. It's been a wonderful opportunity to give back to the SAS user community, one I'll never forget. LL: What excites you most about this year's event? GC: There are so many new things about this year's conference, all geared toward providing an enriching experience for all SAS users. I'll mention three that immediately come to mind. One thing we've tried to do well this year is connect industry with academics. While we'll have a full program of events and talks specifically geared toward students and professors, this year we'll emphasize partnerships with industries in a new way. I might be most excited about Sunday's Talent Connection. This event brings students and SAS professionals together to network, discuss career opportunities and share knowledge, research and partnership opportunities that might exist with each other. I anticipate it being a great success for both students and industry looking to connect with young analytical talent. Another strong focus for us is career development and learning for SAS users at all levels. We'll have a full menu of traditional training and certification opportunities for data scientists, business and data analysts and SAS programmers, but we're also providing opportunities to build on soft-skills development, such as networking, analytical story-telling and much more. We'll also have an on-site Learning Lab, available for several hours each day, where users can explore more than 25 e-learning courses for free. Finally, I'll mention our volunteer opportunities. We'll have several ways for users to give back, but I'm particularly excited about our STEM-related charity event. During meals and evening networking receptions, both Monday and Tuesday, attendees will have the opportunity to work with RAFT Colorado (Resource Area For Teaching), and build STEM-inspired teaching kits for local teachers to use in their classrooms. Each kit will repurpose educational items RAFT has collected and make them available to teachers as creative tools for teaching STEM – inspiring the next generation of thinkers, innovators, problem-solvers and creators. It's an extraordinary opportunity to impact local area children. LL: Speaking of extraordinary, this year's conference theme is "Inspire the Extraordinary." What does that theme mean to you? GC: It means never accept "good enough." I always tell my students to push for something above and beyond what's expected of them, to be extra-ordinary. We expect the same for this year's SAS Global Forum. Knowing the event like I do, I feel confident we're going to deliver a SAS Global Forum that surprises and delights our users in a way they didn't expect. LL: We all know that one of the best things about SAS Global Forum is its incredible content. What can you tell us about the content you’re putting together for this year’s event? GC: Thanks to tons of hard work and research from a lot of SAS users, we've selected fantastic content from renowned speakers from across the world. Perhaps the best part of our content planning this year is the variety. Topics range from deep hard-core programming to high-level strategic thinking about data and analytics. 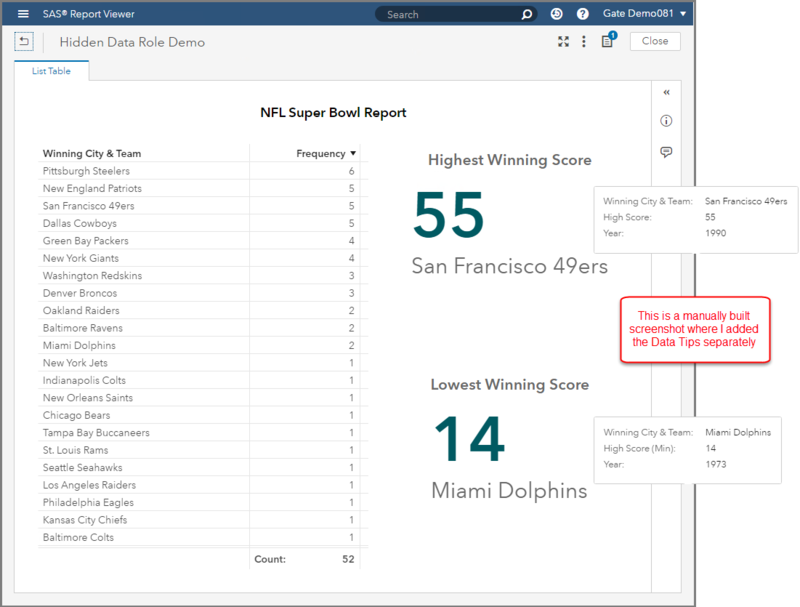 From sessions that will help you to develop yourself personally as a better human-being to learning about optimizing Monday night NFL schedule for best viewership to thinking strategically about data as a currency – there is something of value for everyone. LL: SAS Global Forum is likely to attract more than 5,000 data scientists, analytics professionals and business leaders. Every year it amazes me how many of those users are attending SAS Global Forum for the first time. What advice would you give first-timers? GC: First piece of advice: Have a plan and build a personalized agenda so you don’t get overwhelmed by the large number of available sessions. Second, take every opportunity to engage and network with other attendees. One of the best things about this conference is how willing veteran SAS users (regulars at this conference) are to help and welcome newcomers. So, take advantage of it. If you are sitting down for breakfast or lunch, take the time to introduce yourself to people around you. You may be surprised where it could lead. I'd also encourage attendees to take time to visit the Quad. The Quad is a casual and interactive space where attendees can network with other SAS enthusiasts, view demos and visit with experts from SAS and our sponsors. And, last but not the least, have some fun! 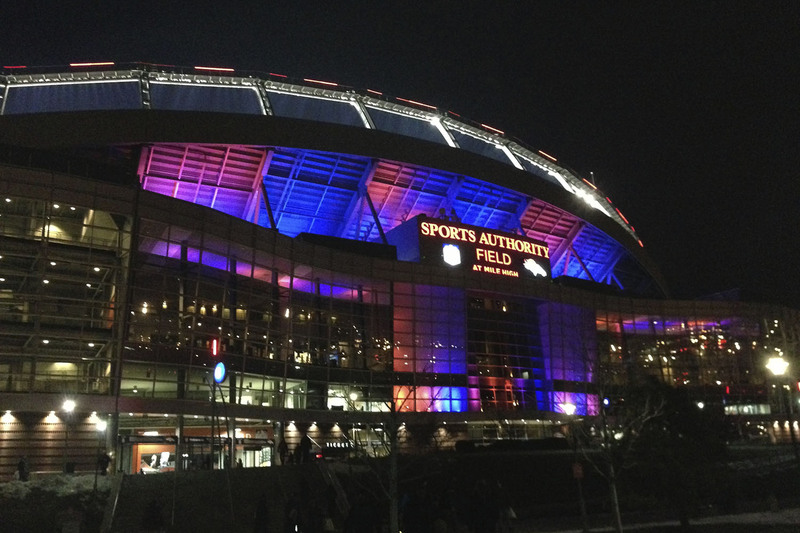 Attend the social events we have planned, especially the Kick Back Party at Mile High Stadium on Tuesday evening. LL: As an academician, I know you’re passionate about learning? What additional learning opportunities, beyond the session talks, are available to attendees? GC: There are so many learning opportunities at SAS Global Forum that it is mind-numbing. Of course, the 20 and 50 minute session talks are the main modes of content delivery, but there are also e-posters, table talks and super demos in the Quad. We'll also have dozens of pre-conference tutorials, post-conference training, and all the activity in the Learning Labs, including hands-on workshops and the ability to take individual e-learning courses. LL: Given your personal interests, I know one of your goals for this year’s conference is to increase participation in the event for students and professors. Can you tell me a little more about the special events you have planned for this audience? GC: For starters, SAS Global Forum is completely “free” for students! As long as you are a full-time enrolled student of an accredited, degree-granting academic institution you can attend free of charge. There are credit hour minimums that must be reached to be eligible, so I'd encourage students to visit the website for complete details. Programmatically, we have the Sunday afternoon sessions entirely dedicated to academics. We have a fantastic academic keynote speaker, Temple Grandin from Colorado State University, and special training sessions for professors interested in teaching analytics at their universities. For students, we offer a number of opportunities to network and special courses, such as how to best use social media for networking while looking for a job, to help them make a successful transition from student to working professional. We also encourage students, and really anyone who has an interest, to attend the presentations students make as winners of the SAS Global Forum Student Symposium Student Symposium. Though closed now, the Symposium provides an opportunity for teams of two to four students and a faculty adviser to showcase their skills and compete with other teams in the application of SAS Analytics in solving a big data problem. This year, more than 60 teams entered; the top eight will present 20-minute talks during the event. LL: Dr. Chakraborty, I've taken a lot of your time, but is there anything else you'd like to share with our readers? GC: Actually, I'd like to thank the many volunteers who have helped put this conference together. From serving on our SAS Global Users Group Executive Board to helping evaluate and select talks, to serving in our Presenter Mentor Program, hundreds of users have invested their time to make this conference the best one yet. SAS Global Forum is truly a user's conference and we depend on the user community to plan, promote and execute so many tasks and activities related to the event. Though I can't call them out by name, I would be remiss if I didn't mention their contributions and take a minute to thank them. LL: Well let's hope they're reading! Dr. Chakraborty, I want to thank you again for your time. I look forward to seeing you in Denver in April. Visit the SAS Global Forum 2018 website for more information and to register. Conference Proceedings will be available shortly before the event begins. How are you inspiring the extraordinary? Why is there more interest in lifelong learning now? How does lifelong learning contribute to the analytics economy? 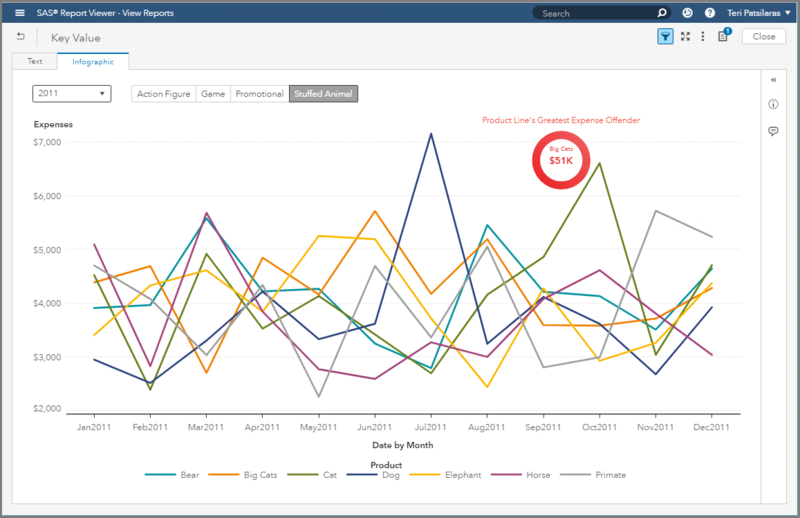 What are your favorite examples of analytics in the not-for-profit sector? How is the education sector influencing the development of citizen data scientists? 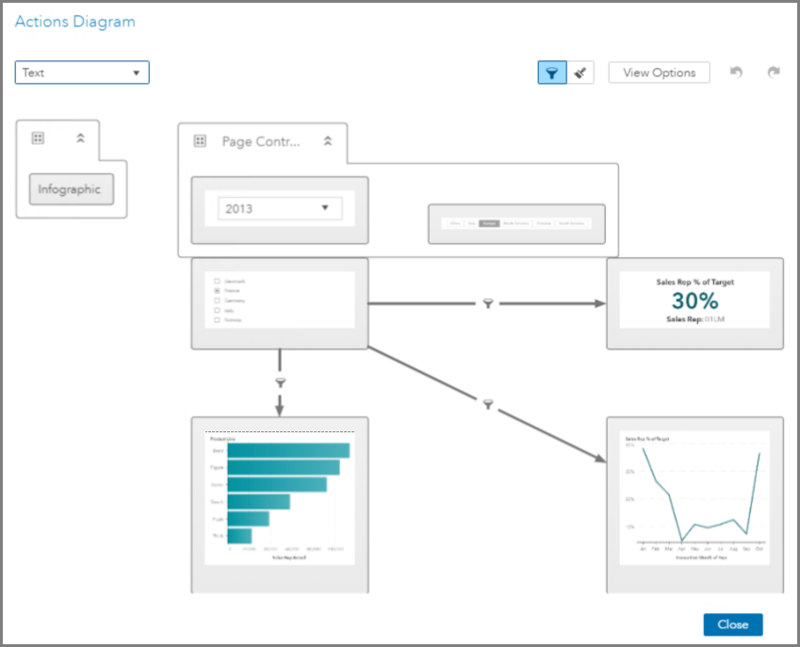 What trends do you see in the consumption of analytics? A conversation with SAS Global Forum 2018 Chair Goutam Chakraborty was published on SAS Users. The post SAS Academy for Data Science creates top-rate analytical professionals appeared first on SAS Learning Post.